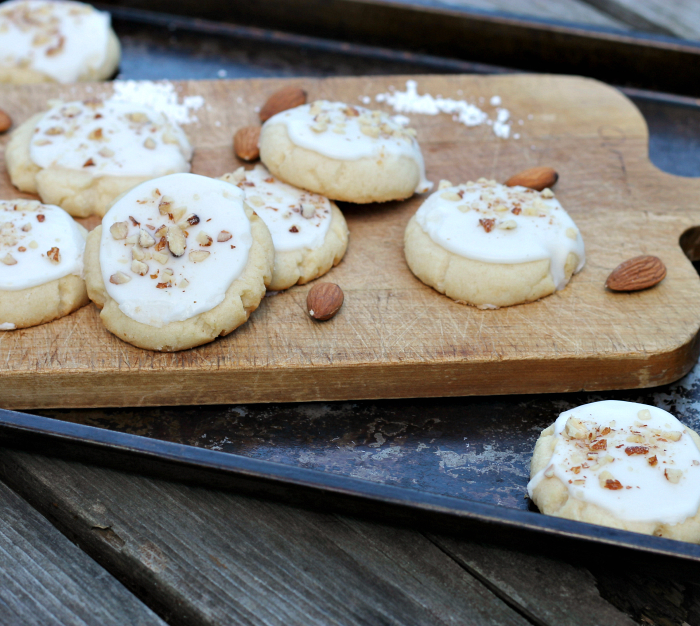 Sugar cookies with a touch of almond flavor… a step above your everyday cookie. When I was a kid sugar cookies were reserved mainly for Christmas. I don’t really remember having sugar cookies year round. But when Christmas rolled around we baked cut out sugar cookies for hours, it was a family favorite. Now that I am an adult, sugar cookies are not on my baking list. For some reason they are not a popular cookie in our house or at least until now. 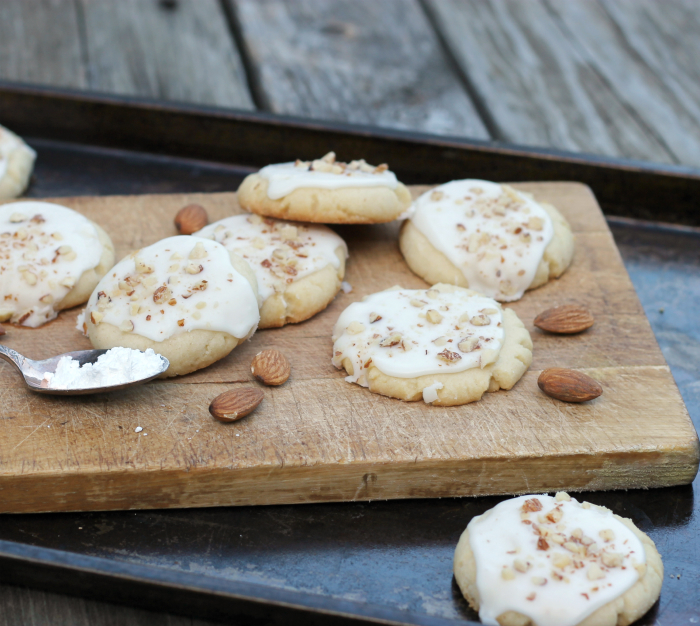 Mike came home from a business trip and mentioned that he had an almond sugar cookie. He thought it would be a good idea for me to bake up a batch. Since I don’t have a favorite sugar cookie recipe, I started looking through my cook books. Nope, no almond sugar cookie recipes. So I decided to take one of the sugar cookie recipes and adapt it a bit to include some almond flavoring. Do you ever buy those cookbooks that the churches or local organization put together? I do once in a while. They have some of the best recipes sometimes. This is where I found my recipe, one from my church cookbook. This is a traditional sugar cookie, even without the almond flavoring. They are a bit more dry and crumbly, maybe more like a shortbread cookie. But they are a cookie that kind of melts in your mouth… oh so yummy. 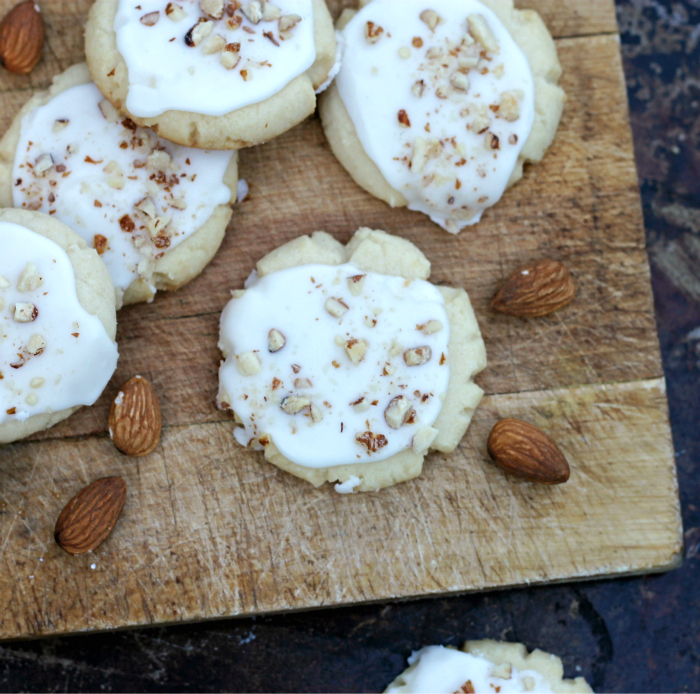 The almond flavoring really makes them several more notches higher than a regular sugar cookie. I added almond flavoring in the frosting and a bit of finely chopped almonds are sprinkled on top of the frosting. Oh my… can you say almond!?! Yum, these definitely are worth making over and over again. And yes, you can freeze them if you don’t eat them all in one sitting. With an electric mixer mix together the butter, oil, and sugars until well blended. Add the eggs and mix well. Blend in the almond extract. Sift together the flour, baking powder, and salt, add to the wet ingredients and mix until well blended. Roll cookies into small balls (about the size of a walnut). Press down with a bottom of a glass. Place cookies in a 350 degree F preheated oven and bake for 13 to 15 minutes or until the bottoms are lightly browned. Place on cooling rack and cool completely. For the frosting mix together the powder sugar, butter, salt, and almond extract. Gradually add the milk until you have the right consistency. Beat until smooth. Frost cooled cookies. If desired, before the frosting is dried sprinkle with finely chopped almonds. They look melt-in-mouth and fantastic, Dawn. Back from vacation and craving something sweet. And this is just the thing! 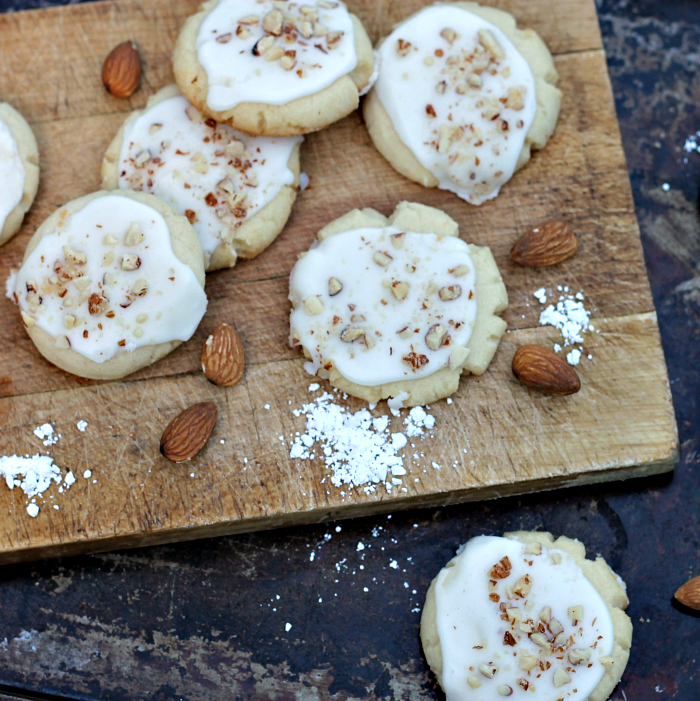 Almond sugar cookies can be really good, and yours look amazing. Thanks so much! I love, love, love making homemade almond flour and meals to bake with. Also, great photos.